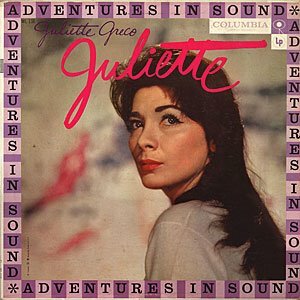 I know much less about Juliette Gréco than I undoubtedly should and would like. I know she had looks and a disposition tailor made for the bohemian lifestyle of Paris (Left Bank of course) in the fifties, she hung out with Sartre and Camus, she starred in Jean Cocteau's marvelous 'Orphée', and she had an affair with Miles Davis ("Juliette was probably the first woman that I loved as an equal human being."). I also know she's made some wonderful records, a few of which I've picked up in flea markets here and there over the years. Musically she sounds a bit like Jacques Brel's female counterpart, very sensual! (That's a really lazy description by the way.) Lyrically I can't say, my French leaves tout to be desired, but I'd wager the words fit the spirit of the period perfectly. Thought of her recently when the subject of important female singers came up on a bulletin board I tend to spend time on, and decided to share a couple of LPs I have by her. This one's a US release from 1958 or thereabouts, next up (in a few days I suspect) will be the fabulous 'La Femme' from 1967.